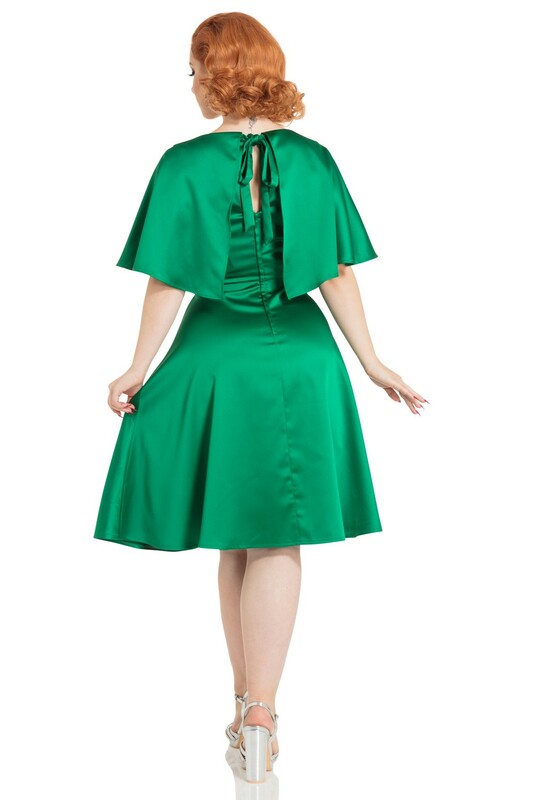 We present the classy Vixen Mariah 1930s Cape Dress In Emerald. adding style and debonair to your vintage look. The Voodoo Vixen Mariah 1930s Dress comes in UK Sizes 6-16 and not only does it look fabulous but it's also super flattering thanks to the deep cup size accommodating both modest and the more voluptuous cups. The delightful Vixen Dress is a pleasure to wear and it'll make you as pretty as a butterfly as you parade across the room with this ever-so gorgeous Mariah dress. Brands such as Voodoo Vixen really break the rules of modern day dressing and what better way to make an entrance with the Voodoo Vixen Mariah 1930s Swing Dress.